In hopeful anticipation of flowers, the cusp of spring seems the appropriate time to celebrate Antonio Neri's most colorful creation; chalcedony glass. 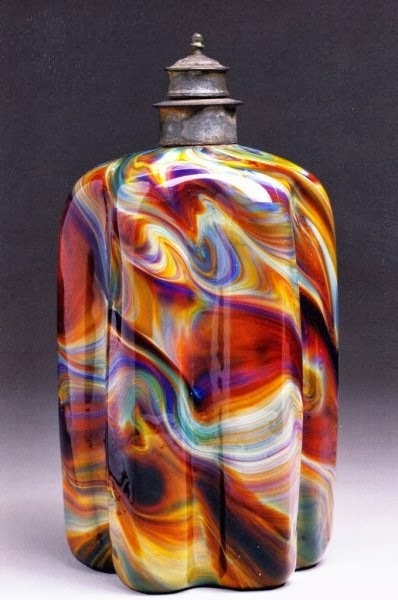 Through his clever technique, the 17th century glassmaker and alchemist managed to throw every color he knew into one glass pot and come up with, not mud, but the opposite—a swirly rainbow glass that defies verbal description. Somehow, he achieves a balance that blends a full range of colors in a way that seems natural and harmonious. While many glass creations survive from the seventeenth century, none is directly attributable to Neri's glass formulation. But, in my opinion, this piece from Brescia comes close to our alchemist's own description.